Jellyfish No. 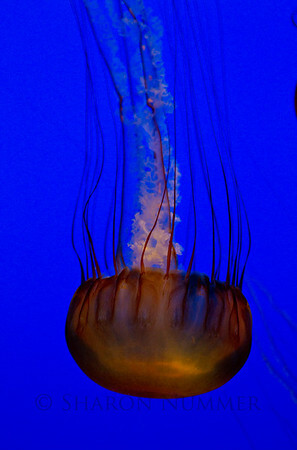 1 at Monterey Bay Aquarium © Sharon Nummer Incredibly mesmerizing, these jellies were wonderful to photograph. I could have stayed and watched and photographed them for quite a while. Jellyfish No. 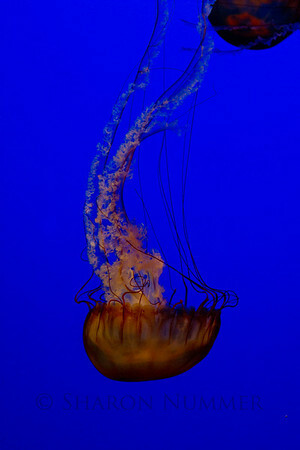 2 © Sharon Nummer Photographed at the Monterey Bay Aquarium. Loved to watch their beautiful movement. Jellyfish No. 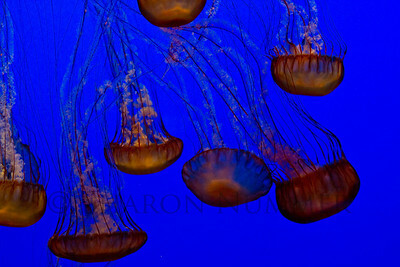 4 © Sharon Nummer These jellies were photographed at Monterey Bay Aquarium. Monterey, California. Hopefully, they will soon be in one of my paintings. 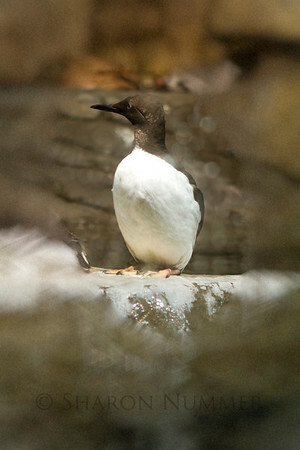 Penguin © Sharon Nummer Photographed at the Monterey Bay Aquarium. This was tricky to photographed as the viewing window was covered with condensation. Luckily, the water drops added some interest to the photo. 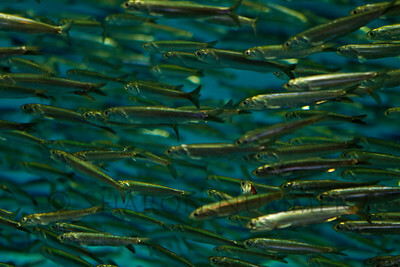 Millions of Sardines © Sharon Nummer I looked up to see a very large school swimming by. I could only hope I'd get them in focus. It's fascinating to watch them swim in such beautiful synchronization. In the wild, it's their survival instinct, but watching them swim was very cool. 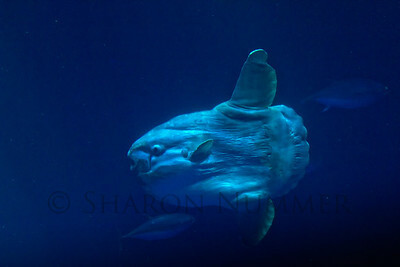 Sunfish © Sharon Nummer What an amazing fish. If I was scuba diving, he'd probably scare me. He's a slow mover, but fun to watch. 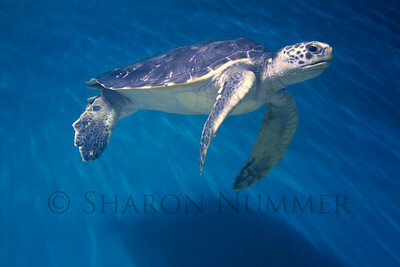 Sea Turtle © Sharon Nummer I love watching the turtle swimming. In reality, the huge tank was pretty dark, but I got lucky and was able to capture this guy with the wonderful lighting. 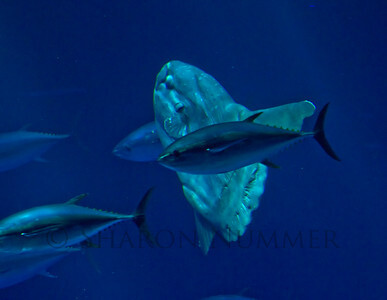 Sunfish with other fish. © Sharon I'm not sure, but I think these other fish are tuna. So happy I got them in focus. 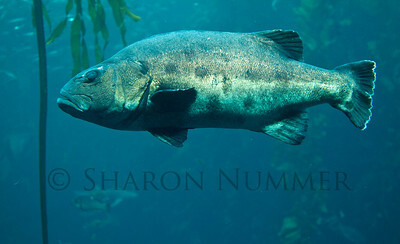 Photographing at this large tank was not easy, as it was fairly dark. 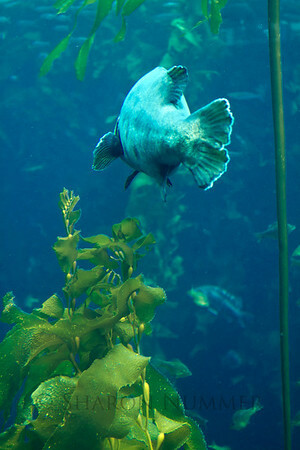 Fish in the kelp forest © Sharon Nummer I still have to identify this fish, but he kept swimming by the viewing area where I was standing. Maybe he was a ham! But, he gave me plenty of opportunity to capture him digitally. 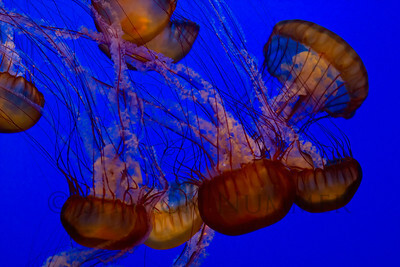 Incredibly mesmerizing, these jellies were wonderful to photograph. I could have stayed and watched and photographed them for quite a while.